Uh oh! Doesn’t sound good. Nice job with the reaction in this snippet. Intriguing snippet! So much information in so few words. Drew me right in and now I can’t wait for the next peek. Uh oh, going outside sounds like a really bad idea! 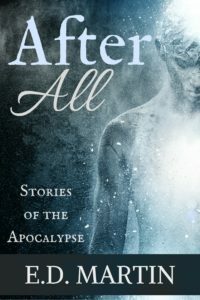 Can’t wait to read more – I love post apocalyptic stories. Great snippet! I’m officially hooked. Great snippet! I loved how Yaya’s fear is clear and direct in so few lines. I like how you lead us gently but inexorably to the realization of what Outside must be. I’m wondering what might happen, since going on the outside seems dangerous. The tension in this snippet really comes through! Usually going outside is pleasurable. Now I’ll think better of leaving home. Oooo what does going Outside mean??? You got me hooked with this snippet. Can’t wait for next week to find out what Outside means. Intriguing snippet – always a good twist when something that should be natural and normal is hinted to be rather more sinister!